From time to time my occasional work as a performing arts critic in Texas causes me to miss some important event here in New York. 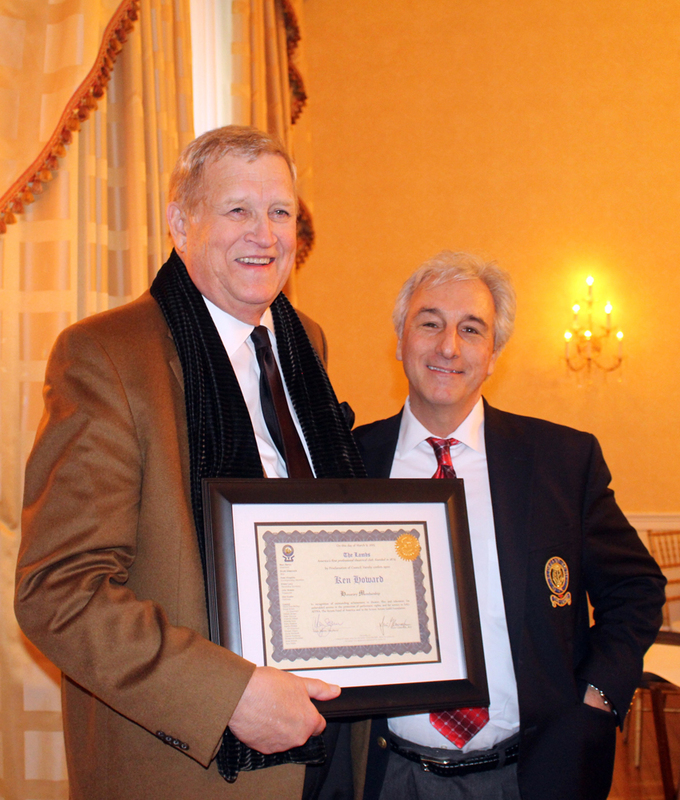 That was never truer than on last March 9th when Marc Baron, the leader of America’ oldest theatrical club, The Lambs, hosted a memorable Shepherd’s Luncheon at the Club to honor the esteemed President of SAG-AFTRA, actor Ken Howard. But all was not lost when I learned that Mr. Howard’s important union would make available a full internet video of his fascinating remarks on that gala occasion. Thus, as a proud Lamb myself, I had the pleasure of enjoying the event from afar in The Lone Star State, and like any delighted critic, I feel I must weigh in. He began his talk with a perfect re-telling of the popular old theatrical adage about how, “The Lambs Club is where actors try to be gentlemen, The Players Club is where gentlemen try to be actors, and the Friars Club is where neither try to be both.” Howard confessed he is at the half-century mark as “an actor trying to be a gentleman,” and the crowd roared with laughter. It wouldn’t be the last time. There was more merriment when Ken used his considerable singing voice to playfully mimic his father’s impressions of assorted singers. If you were not there that day, don’t miss Ken’s hilarious versions of Bing Crosby’s, “When the Blue of the Night,” Jimmy Durante’s “Inky Dinky Doo,” and the Ink Spots’ “We Three (My Echo, My Shadow, and Me)” complete with a falsetto that brought the house down. Ken shared many fascinating tales of his career, even tracing high school performances in such shows as, Annie Get Your Gun, Carousel, & Oklahoma. In college he shared how he overcame his fear of doing dramatic plays when a friend explained that such productions were “just like musicals without the songs.” Armed with that knowledge, Ken would soon perform in, The Andersonville Trial, Long Day’s Journey into Night, and The Scottish Play, playing the lead in the latter. There were more great stories about working as a page at NBC, winning a fellowship to Yale, studying with such noted teachers as Stella Adler, and even amusing employment as a singing waiter. There would be more laughter for his tale of singing, “I Enjoy Being a Girl” when auditioning for How to Succeed in Business Without Really Trying. But Ken could just as quickly move past the silliness, as the audience could see when he suddenly launched into the flawless delivery of a perfectly memorized and very long passage from Shakespeare’s Julius Caesar. Ken spoke affectionately of working on Broadway with Jill O’Hara when she was starring in Promises, Promises. Happily, Miss O’Hara was one of those present at the luncheon. Of course there were stories of Ken’s classic portrayal of Thomas Jefferson in the legendary Broadway musical (and film), 1776. Another Broadway adventure was Ken’s Tony Award-winning performance in Child’s Play, during a period that featured interesting encounters with the likes of Otto Preminger, Liza Minnelli, and of course, the notorious Broadway impresario, David Merrick. This entry was posted in American Theatre Critics Association, Broadway, BroadwayStars.com, Jill O'Hara, Ken Howard, Norman Lear, SAG-AFTRA, The Lambs Club, ThePeoplesCritic.com, Uncategorized and tagged Broadway, SAG-AFTRA. Bookmark the permalink.